Feel free to leave a comment on the VoiceThread if you see a piece you particularly like! 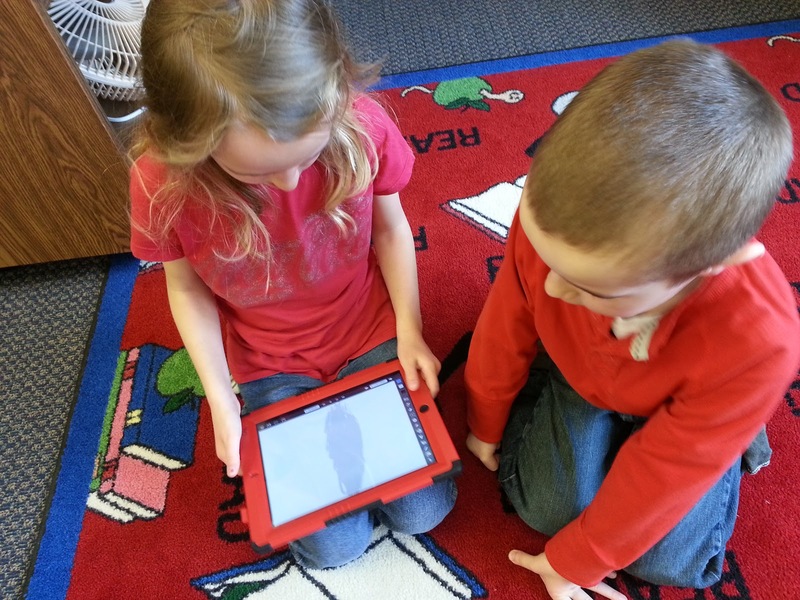 One Bulldog group of Kindergarten students created videos with a spring theme. During Bulldog Time, students are given work that challenges them, whether that be relearning things taught in the classroom, pushing them further in their knowledge, or supporting their special area of need. 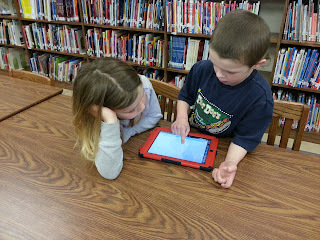 This group of students worked in the library to research a spring topic. 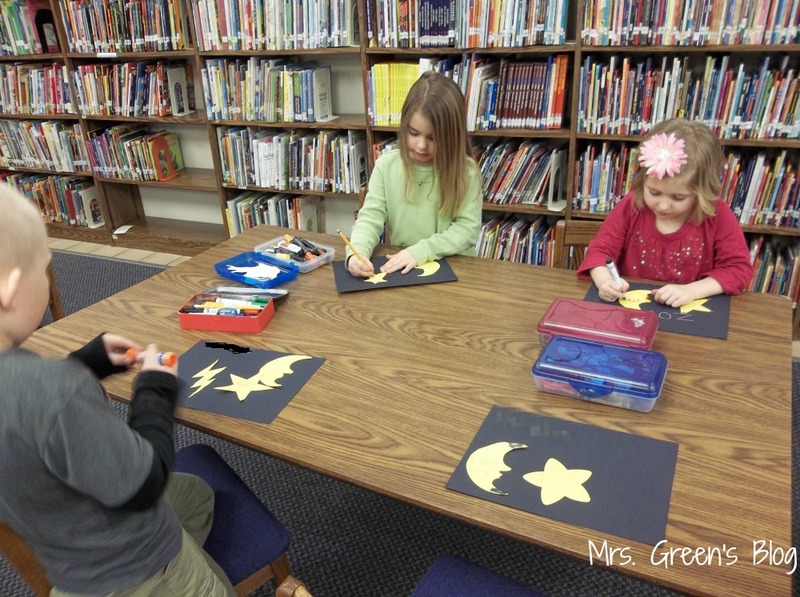 First we read a few books about Spring to get our ideas flowing. 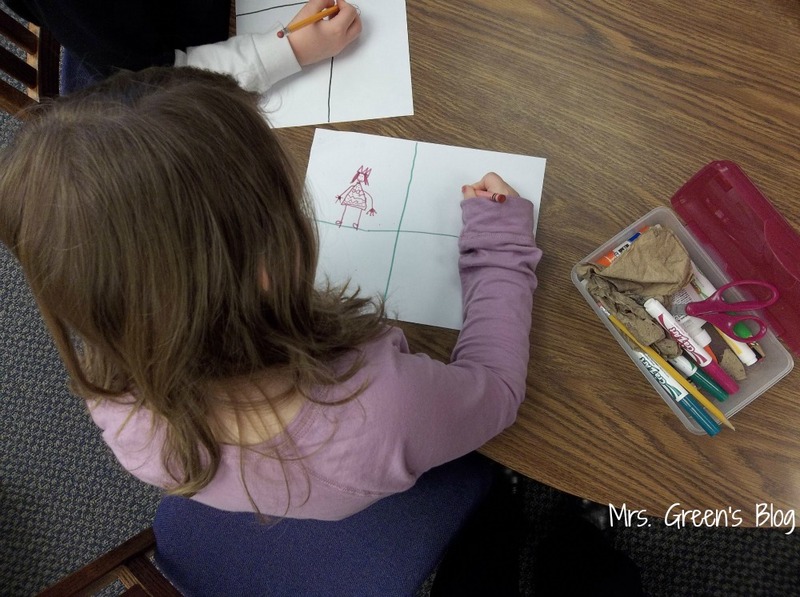 Students were broken into groups and then decided what they would like to focus on. 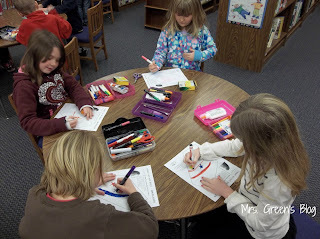 After that we found books in the library that suit their needs and they began planning what they were going to use for facts. To see more videos, you can check out our YouTube channel. 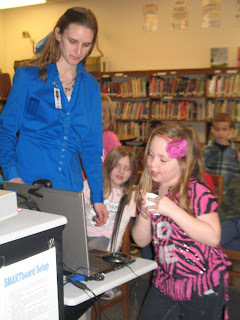 Second grade students at Parkview Elementary learned about all of the different biomes in the world. Each student then chose one biome to research. 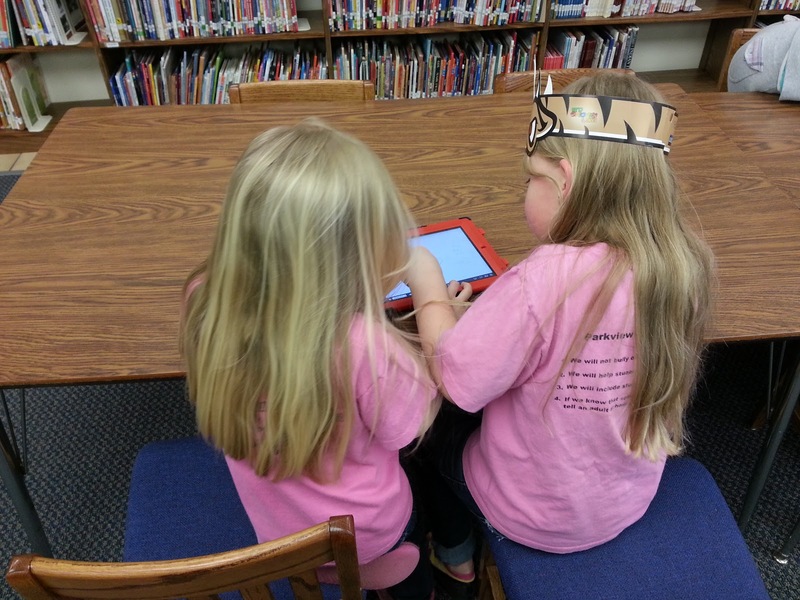 After researching, the students created a PowerPoint about their biome to share with others. 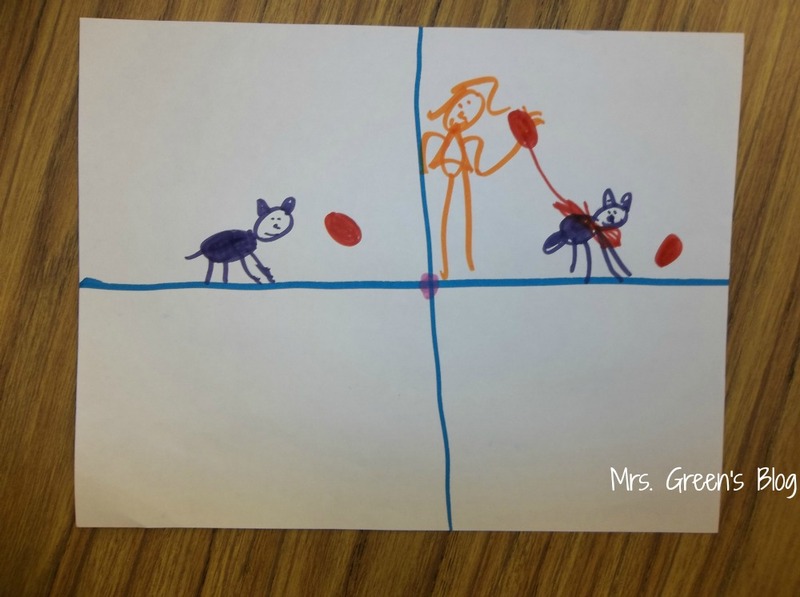 Below is one example from a student in Mrs. Calabria's class. Happy National Library Week to you all! It was a great week here in New London celebrating all that our libraries are and can do for our teachers and students! 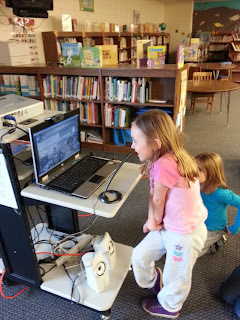 Students and staff were invited to tell us why the library was important to them. 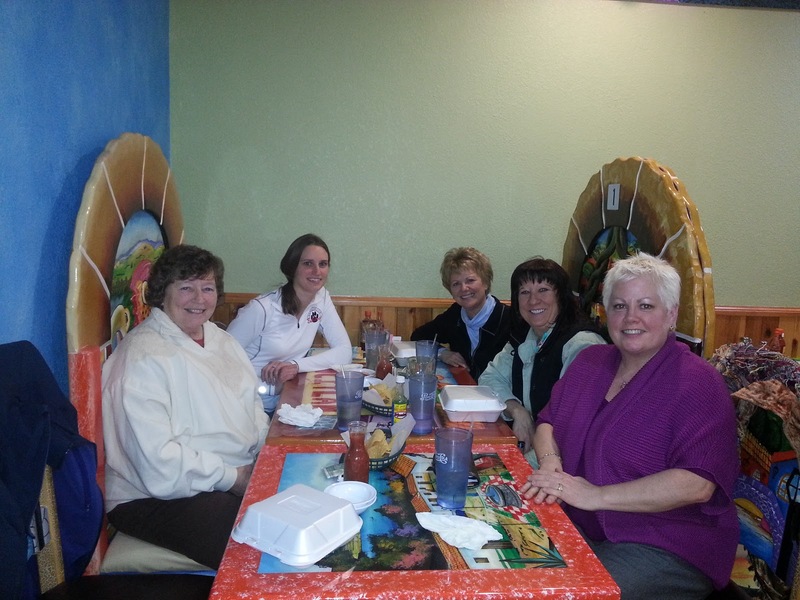 This picture was taken late in the week and we had even more turned in after this! 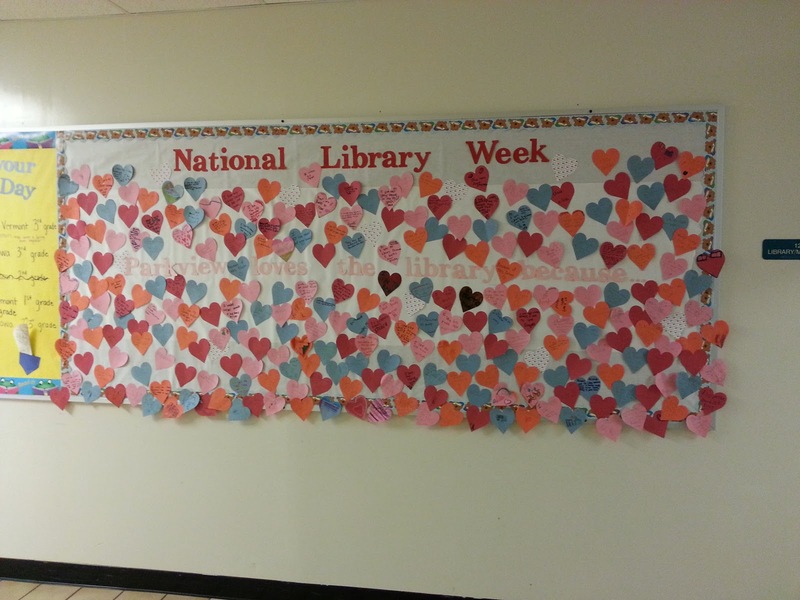 We are overflowing with love for the library! 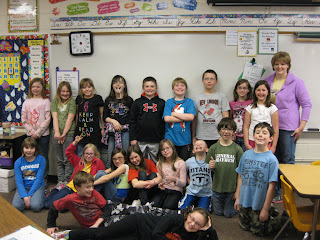 Wednesday at Parkview was Poem in Your Pocket Day. You can read more about that HERE. Friday all elementary students were invited to wear a readable t-shirt. 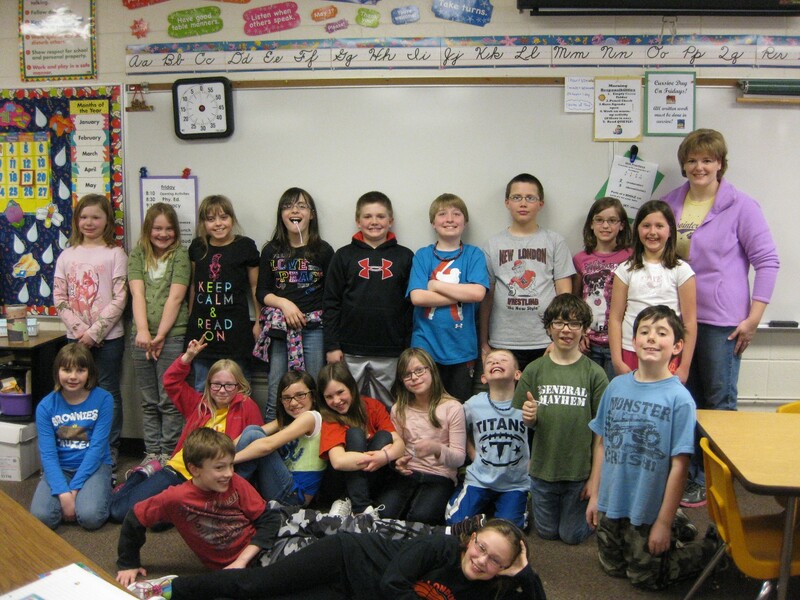 Mrs. Saucerman's class had a lot of readable t-shirts! 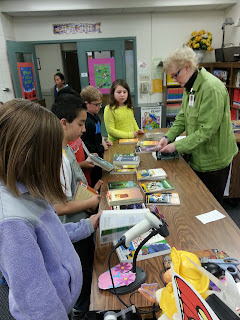 Throughout the week, all elementary students received a free book from the library to take home and keep forever. They really enjoyed that and some of the students couldn't believe they didn't have to bring it back! Here Mrs. Cherf helps Mrs. Kloehn with book distribution to 4th graders. And for a bit of fun, all of the elementary library ladies got together to celebrate "our week" over dinner! I hope you had a wonderful week and remember that the library is a great place all year long, not just one week in April! Hello! Today was an exciting day! 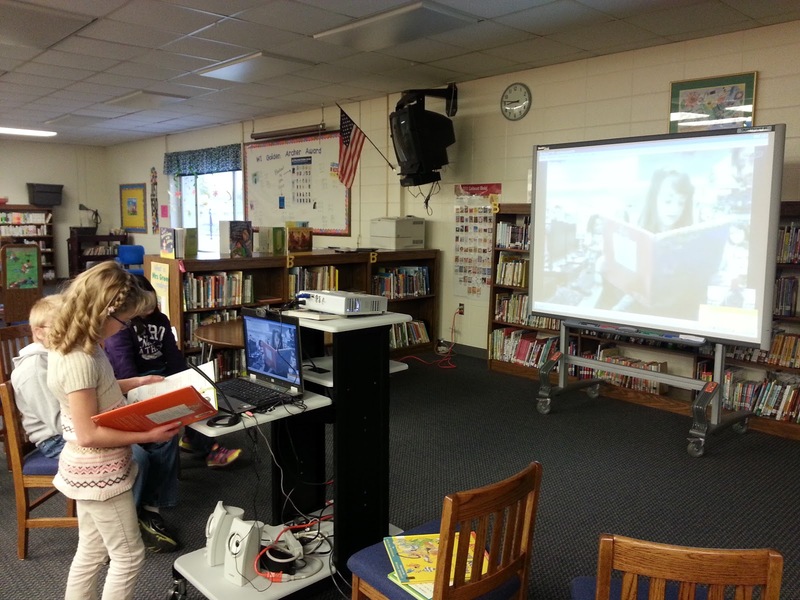 Thanks to Shannon Miller, I was able to connect Parkview Elementary with lots of other schools around the nation to celebrate Poem in Your Pocket Day! Classrooms were able to connect with others using Skype to share poetry. It was a great day and students loved to read poetry, whether it was theirs or one they selected from a book, as well as hear other students read to them. I saw a really awesome bulletin board on Seize the Day with Second Grade. 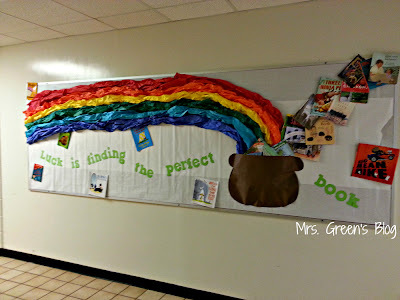 It inspired this rainbow bulletin board. I put this up in March, just outside my library. 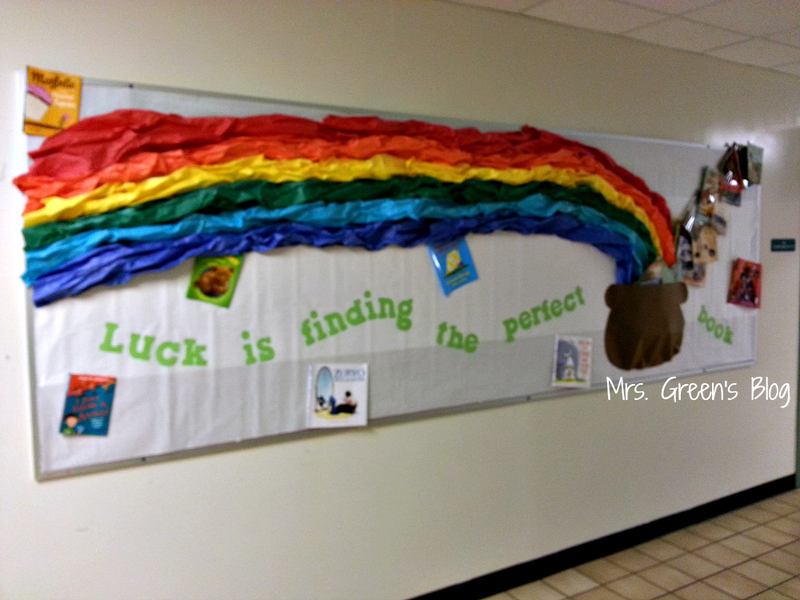 I filled the empty space with book covers and the saying "Luck is finding the perfect book". The saying is cut from the Cricut cart Birthday Bash at 3.5". The book covers are from recent JLG book orders. Kids really like seeing the book covers and it sparks interest in new books. Second grade is working on completing their unit on biographies. Students learned about the 921 biography section in the library and, after having time to browse, selected a biography that interested them. They then completed a graphic organizer which listed at least five facts about their person. I stepped in for the production portion of the project. Students selected an image from Britannica Image Quest, a picture database we subscribe to. We then used Blabberize to make our famous person speak about themselves. What did I learn from this project? Blabberize is as temperamental as ever. I really love their service and the kids do too but I'm not sure I can suggest it's use anymore. I could get about 5 bios recorded and then it just wouldn't work anymore. It took many days of a few kids at a time to get this project done. If you have alternatives to suggest, please do so! I would love to hear them! Wow! 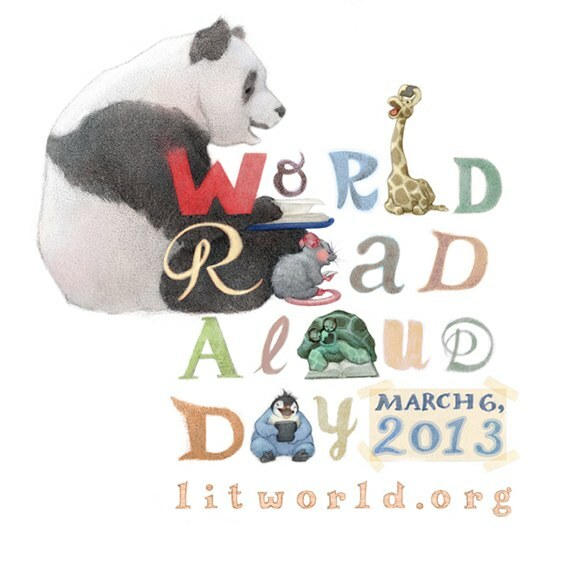 World Read Aloud Day was a whirlwind of adventure for our Parkview students! World Read Aloud Day is sponsored by LitWorld and is a day to celebrate the right of everyone to read aloud. This day has been in the works for our elementary students for a few weeks now and we were so excited for it to finally arrive. 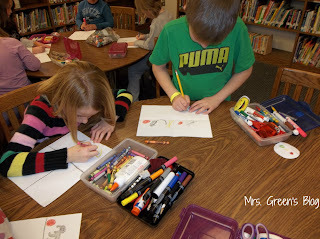 8:30am - Mrs. Calabria's second grade classroom met author Meg McKinlay. It was very exciting that since she lives in Australia, we had just gotten up for the day and she was getting ready for bed! 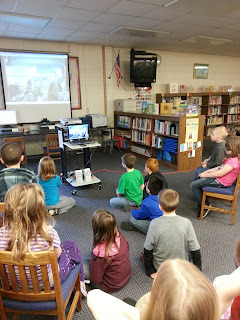 10:00am - All three first grade classrooms met with author Jamie Michalak. We even got a sneak peak of newest not-yet-published Joe and Sparky book! 11:10am - Fourth graders in Mr. Laufenberg's class read I Want My Hat Back by Jon Klassen to a Kindergarten class in Massachusetts. 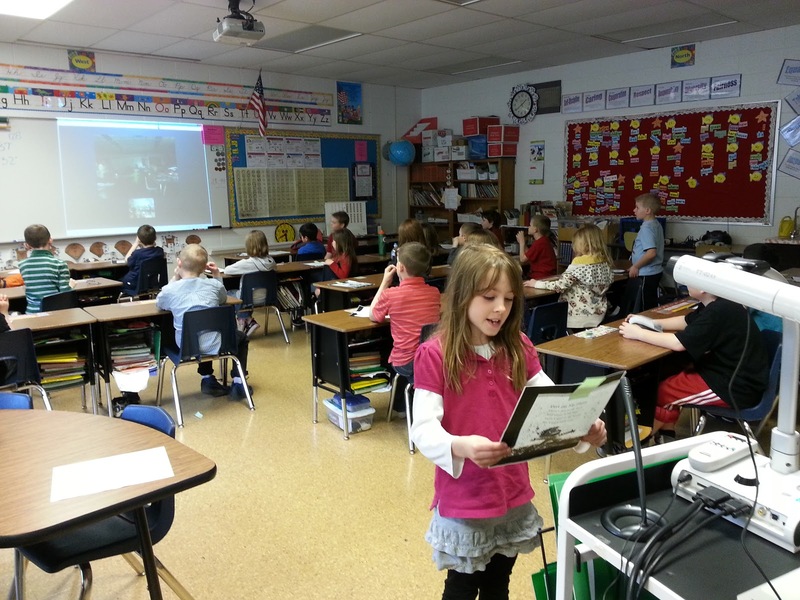 1:30pm - Mrs. Cardinal's Kindergarten class was read to by a third grade classroom in Iowa. They shared the book Three Snow Bears by Jan Brett. 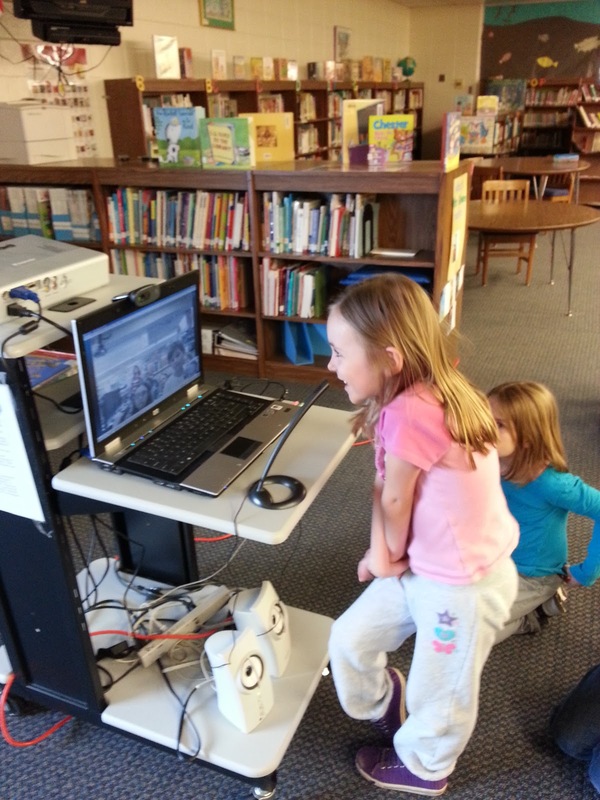 World Read Aloud Day was an amazing experience for our school, as it was the first time to Skype for many teachers and students. Connecting globally is wonderful and exciting! 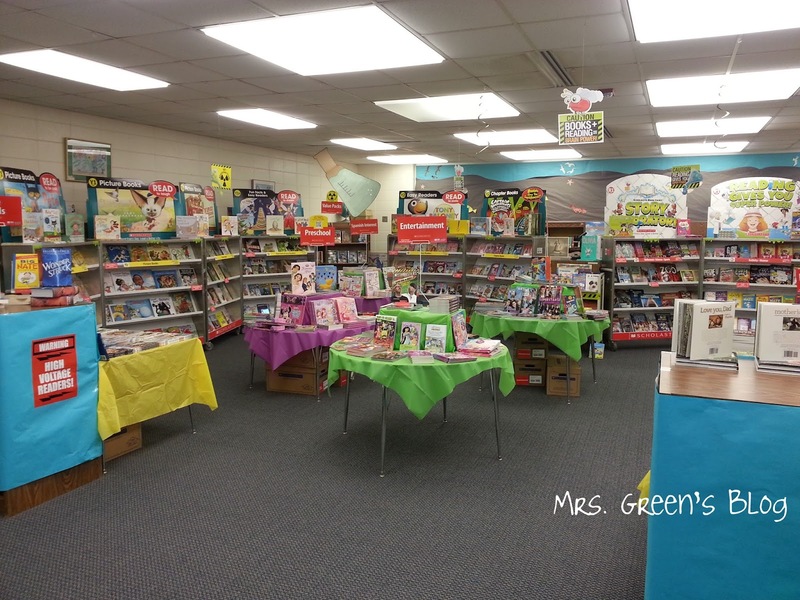 I just finished out a very successful Book Fair at the largest of my elementary schools. It was such a great year! 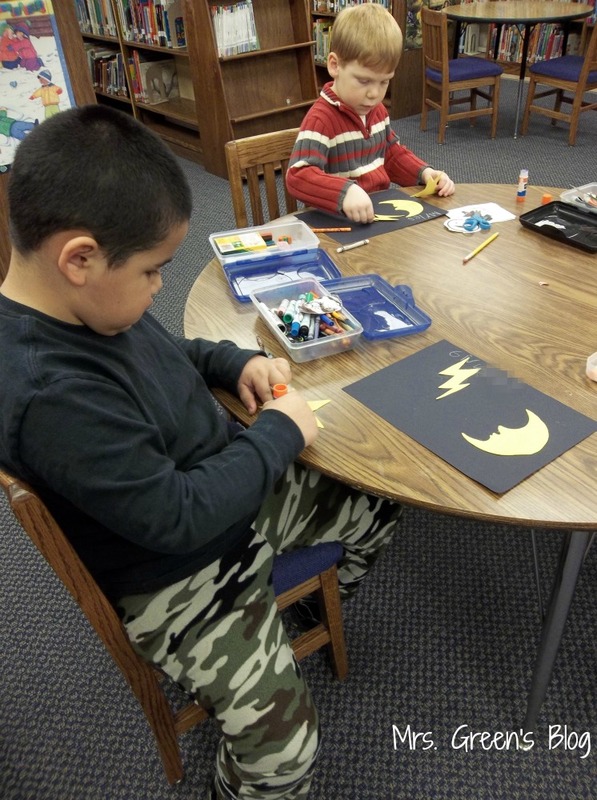 The spring theme from Scholastic is "Story Laboratory: reading gives you superpower". I went all out with the science lab theme. The first thing I made sure to do was order the decorating kit from the Scholastic Resource Kit. I always use a portion of the $100 advance Scholastic Dollars they give you to purchase this. While a majority of the items I use are re-purposed or purchased, these kits always seem to have the little details that you can't find anywhere else. 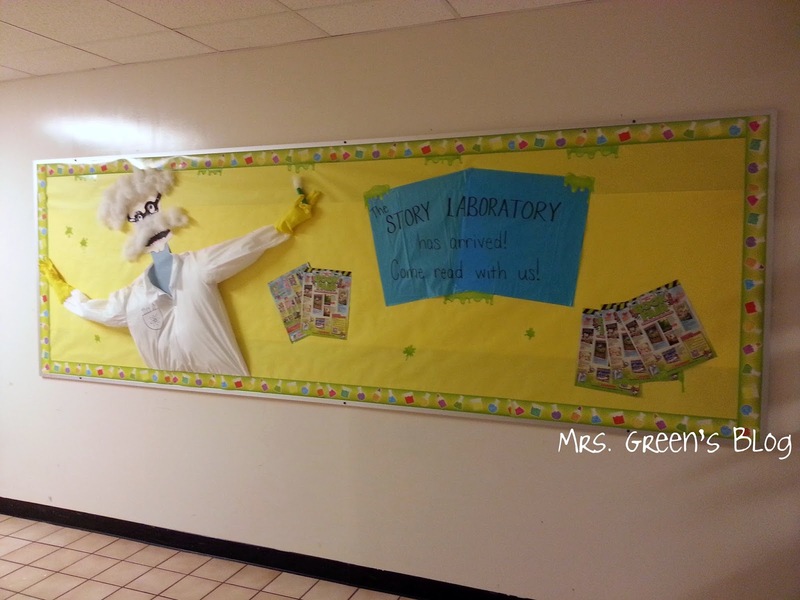 This idea was born from this science bulletin board. The reading tube was an idea from Scholastic. I purchased the clear PVC rooking panel and concrete form that the duct tape is wrapped around from Menards. 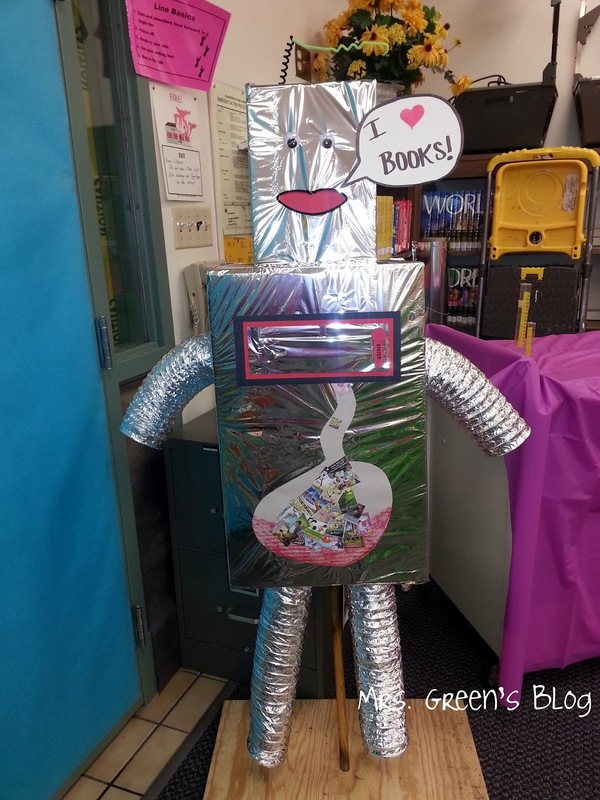 This robot was inspired by this amazing post on Book Fair decorations. 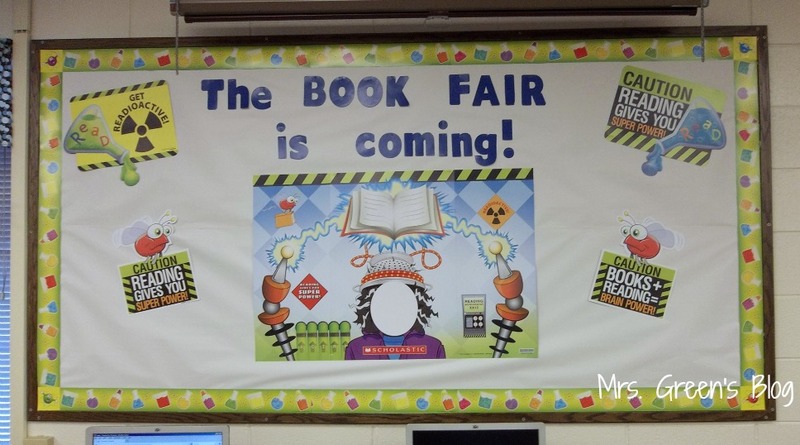 Are you having a Book Fair? I would love to see pictures of what you did. Share your link in the comments! 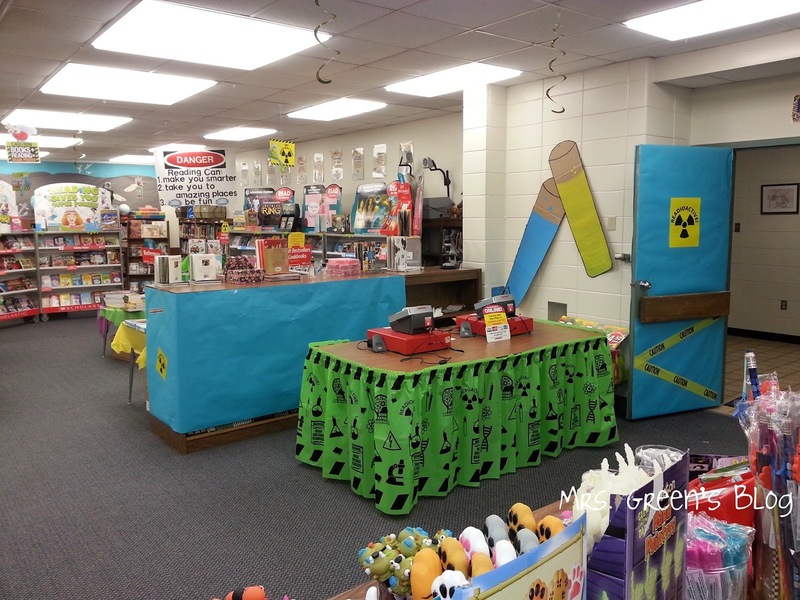 Our Spring Book Fair at Parkview is almost here! 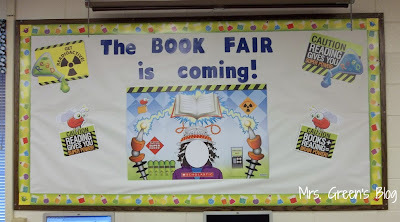 To get the kids excited, I put up a simple bulletin board using the fair decorating kit available from the Scholastic School Resource Catalog. The borders were also purchased from there. You can visit our online fair here until March 12. As I get more ready for the Fair, I will be sure to share. I know I am always looking for ideas! 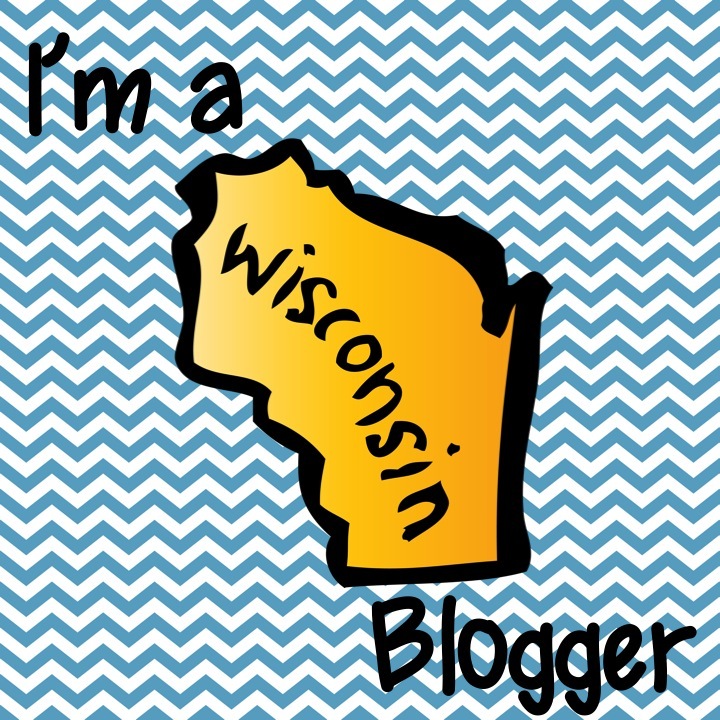 WI Golden Archer Awards - Week Five - Happy Pig Day! I saved the book Happy Pig Day! by Mo Willems for the last book in our Golden Archer program. I did this because I knew the kids were excited to hear it and I wanted to keep that excitement going until the very end. Dangling the carrot perhaps? This is another Elephant and Piggie book in which Gerald, the elephant, feels as though he has done something wrong. He receives a big surprise though and all is well in the end. This book is written through dialogue and the students really enjoyed it. 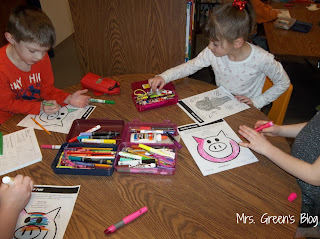 For our activity, I took two pages from the Happy Pig Day! Event Kit published by Pigeon Presents for Children. 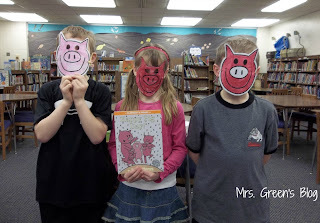 Students were able to help Gerald get dressed for the big event or create a Pig mask of their own to wear. The pig mask was more popular by far but Gerald had a few fans as well. Next week is voting! I can't wait to find out how my kids vote, as this year all of the books are very good in my eyes! Are you participating? Please share in the comments what you are doing that works well for you! 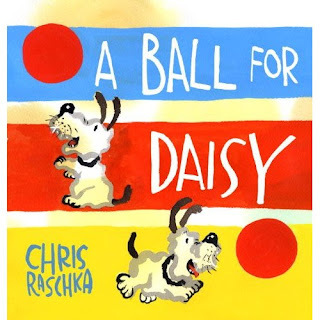 Week four of the WI Golden Archer Awards program brings my groups to A Ball for Daisy by Chris Raschka. This book was the 2012 Caldecott Medal winner. I chose to do this book next so that we could practice our new skill of reading wordless books. Students remembered right away to not cheat by looking ahead at the pictures to come on the page. This is especially important for the climax of this story. This story features a cat named Rosie. In the second frame, her owner is taking her for a walk. I am having a bad memory right now but this student had an entire story already going with just these two frames. She was very excited to take her paper with her so she could finish the story at her next opportunity. Perhaps she will bring it back to share next week? This story is of a man who goes on the hunt for a shark. It takes him a long time but eventually he finds one. Again, the amount of detail the student was telling me while explaining the photo was amazing. Students are amazing! 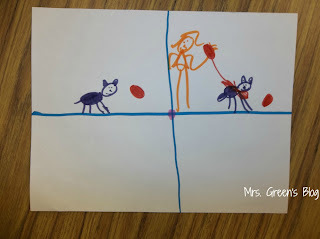 I found that my second grade classes were the best at telling this story because they were really able to put themselves in the place of Daisy and think about her feelings throughout the story. 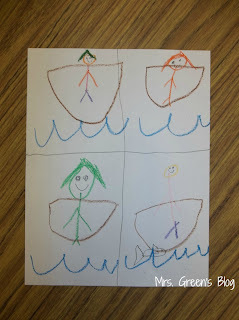 All of the levels understood the story but second grade showed the most empathy for Daisy. Stay tuned - two more books to go! It is week three of our Golden Archer Awards program and we are reading Polo and the Dragon by Regis Faller. This is a wordless book in which a little dog has some trouble with his boat and enters a jungle only to meet a fearsome dragon! Nah, the dragon turns out the be nice and helps the dog with his boat trouble. Many of my classes had not read a wordless book before so to introduce the process, I showed one page from another nominee and 2012 Caldecott winner, A Ball for Daisy by Chris Raschka. 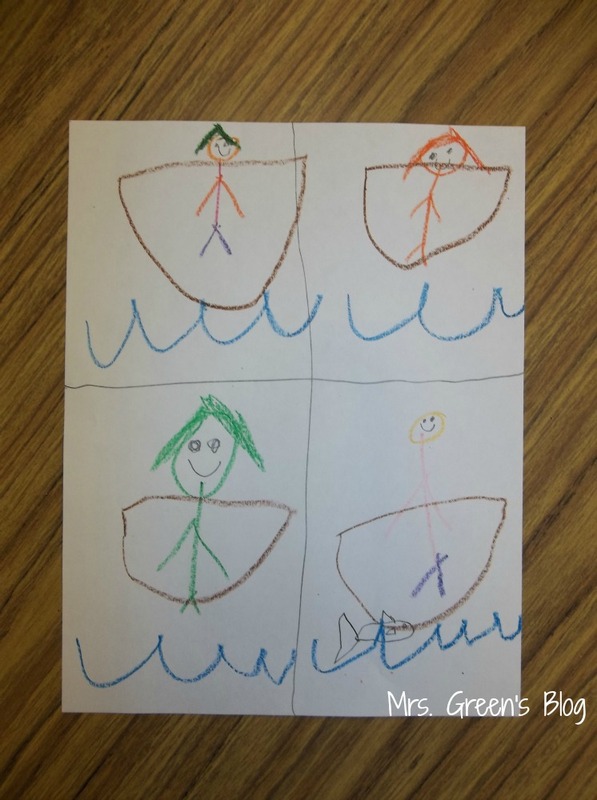 Students learned how to navigate a wordless page by starting to read from the upper left corner, just like if there were text there. 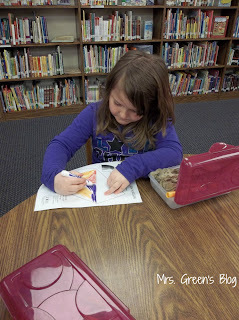 We examined an entire two page set before moving on to read Polo and the Dragon. This book won over several students who I thought it wouldn't. Yes, it's that good. I really am starting to wonder who is going to get the most votes here at my schools for the Golden Archer Award. Only two more books to go and then we will find out! We are in the second week of our Golden Archer program which means it's time for our second read aloud! This week I chose to go with I Want My Hat Back by Jon Klassen. Jon Klassen just won the 2013 Caldecott Medal for his follow-up book to this, This is Not My Hat. Congratulations! 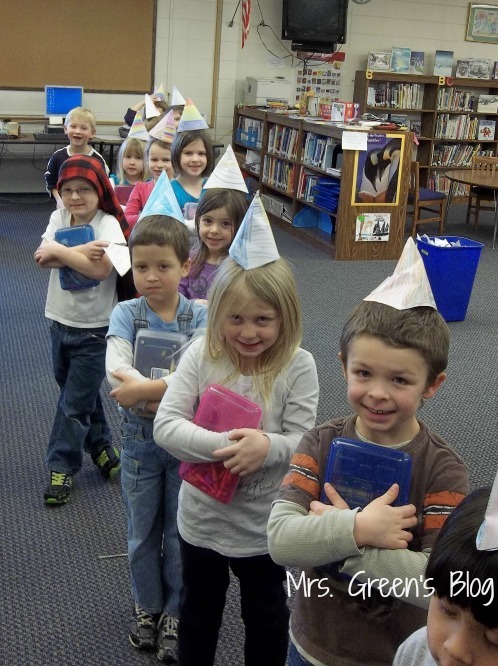 As a follow up to reading the book, students created miniature hats just like Bear's. I found the hat template here on Scribd. They love their mini hats! Stay tuned for week three of our Golden Archer reads! 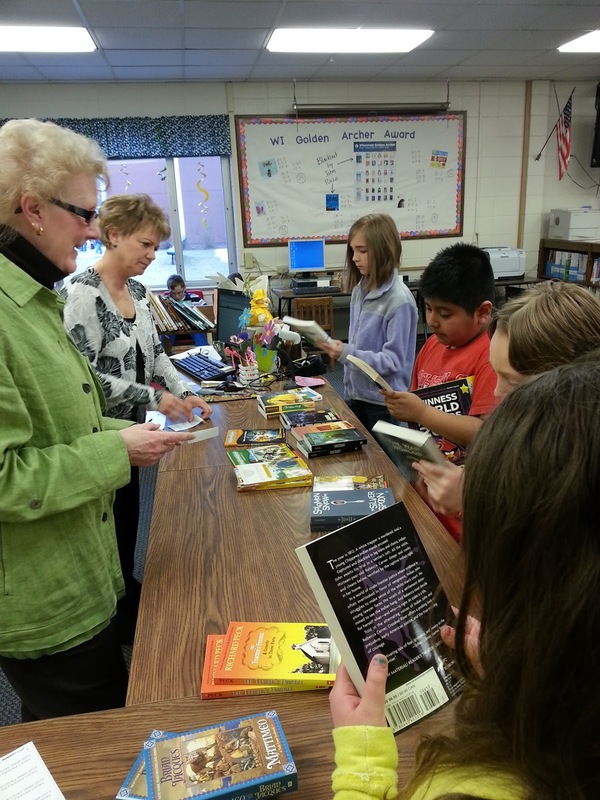 The time of year has arrived for the WI Golden Archer Awards program to begin in my libraries! This is a student-chosen award given out to one book in each of three levels: primary, intermediate, and middle/junior high school. The award is run by and sponsored by the state library association, WEMTA. In my schools, I do this with all of the kindergarten and first grade classrooms. I also have one school in which the second grade is also participating. This week was our first week of the program and we started by reading Blackout by John Rocco. This book is a Caldecott honor book. I wonder if it will be a Golden Archer Award winner as well? 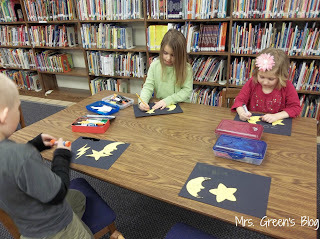 I wasn't sure how kids would feel about this book but it turns out they absolutely loved it! This one might be hard to beat! Stay tuned for the next four weeks! 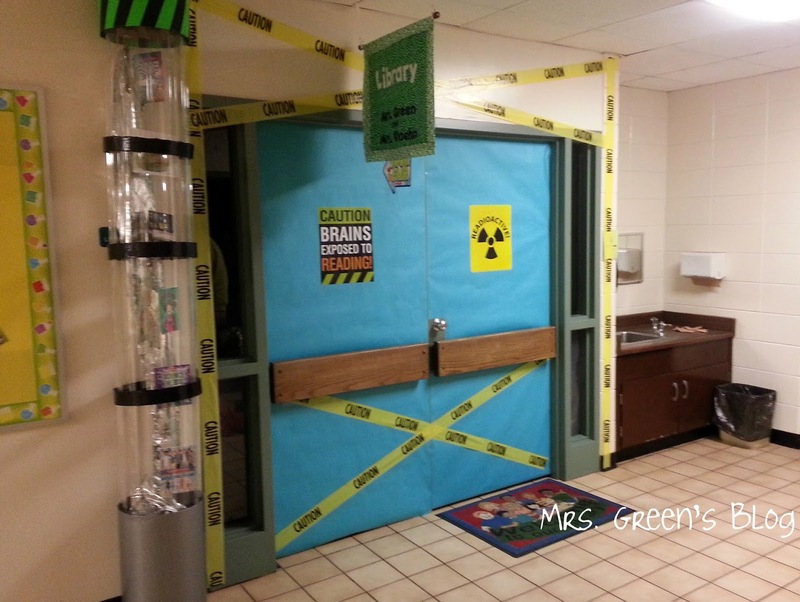 Fourth grade students recently studied safety and nutrition as part of their science curriculum. In looking for something new to do with this unit, the classroom teacher and I collaborated on using Prezi to come up with interactive presentations. - create one Prezi account under my username that we all used. - found the plate pictures ahead of time, as there are so many variations out there. - how small students wanted to make their supporting sentences. We even lost a few because they were so little! 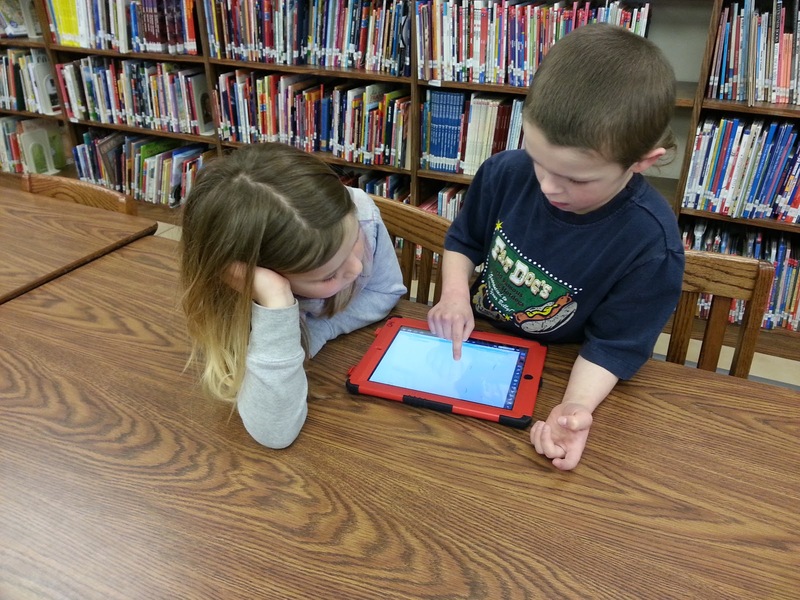 - Prezis must be made public for parents to view them when embeded on your website!